- The Ida Wall Gardens are perfect for gardeners who have limited space available. 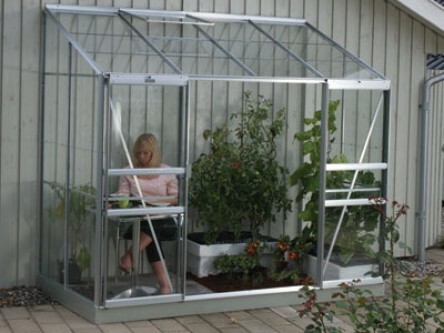 Designed for use on balconies, patios or walled gardens, these models are ideal for plants, seedlings and tomatoes. Each of the three models has one roof vent and a high ridge to ensure easy access. The Ida 900 and 1300 both have a single smooth action sliding door, whereas the Ida 3300 has front mounted double doors for increased access. Prefabricated steel bases are available as an optional extra, as is a shelf set for the Ida 900 and 1300 which, comprising two shelves, substantially increases the growing area. The table below displays the specifications in the imperial and metric system.